DESCRIPTION FROM THE PUBLISHER: Sixth graders Dominic, Loop, and Z stumble upon a new magic shop in town and can’t wait to spend their summer mastering cool tricks to gain access to the Vault, a key holders-only back room bound to hold all kinds of secrets. And once they get in, they set their sights even higher: a huge competition at the end of the summer. They work on their card tricks, sleights, and vanishing acts, trying to come up with the most awesome routines possible….Problem is, the trip is expensive, and it’s money that each guy’s family just doesn’t have. Diana López, author of Confetti Girl and Ask My Mood Ring How I Feel, offers a story that’s just the right mix of heart, high jinks, and a bit of magic. MY TWO CENTS: There’s a reason that magic trick kits sell so well at toy stores. Lots of kids love the thrill of stage magic – practicing illusions until they’re just right, creating mystery with visual puzzles, and tricking others with sleights of hand. Performing magic can help build kids’ confidence and give them a sense of agency when they might otherwise feel powerless. That’s certainly the case for Dominic, Loop, and Z, three friends who venture into the world of illusion at Conjuring Cats, the new magic store in Victoria, Texas. Each of the boys is facing a quandary that makes him feel powerless. Dominic’s parents are divorced and refuse to speak to each other, which frustrates him to no end. Meanwhile, Loop just found out that his father is actually his stepfather, and Z, the youngest child in a large family, always feels invisible. Their new magical hobby, however, leads to a summer of discovery that none of the friends expect. One of the most valuable lessons I took away from Nothing Up My Sleeve is that hobbies are important. Once Dominic, Loop, and Z get involved in magic, they blossom. Sure, they encounter struggles along the way – jealousy, in-fighting, money troubles, family drama – but these difficulties only cause the boys to grow cognitively, socially, and emotionally. The teacher in me loves how practicing magic stimulates their critical thinking skills as they write patter (“what a magician says while performing a trick,” p. 134) for their routines and synthesize new tricks by putting their own personal spins on classic illusions. Really smart stuff! As the friends puzzle through magic, you can see how clever each boy is in his own way. This is the beauty of hobbies – kids expressing their intelligence and creativity through fun, personally meaningful activities. OK, enough with the nerdy teacher musings. Another quality that I love about Diana López’s books is their attention to character development, and Nothing Up My Sleeve doesn’t disappoint. With magic as the backdrop, she conjures three well-rounded, realistic characters who face struggles and earn triumphs just like any real kid might. López creates a strong balance between the boys’ magical endeavors and their personal and home lives that gives this book the perfect blend of excitement and real world relevance. Furthermore, I have to stress how much it means to me that López sets this book (and her other books) in South Texas. Catching references to places I know – Victoria, Refugio, Corpus Christi, and Houston – made me smile. Like me, a lot of young readers appreciate it when stories are set near their homes. A familiar setting can create a comfortable feeling, which, in turn, can make a book even more personally meaningful and engaging. With so many books, movies, and TV shows set in well known locales like New York and Los Angeles, it’s refreshing to find home in the pages of a book. Thank you, Ms. López for an enjoyable, relatable read! TEACHING TIPS: As I read through Nothing Up My Sleeve, I couldn’t help thinking what a wonderful summer reading book it would be. Dominic, Loop, and Z’s adventures take place during the summer, and I can easily imagine kids soaking up this book on languid afternoons in June, July, and August. If you teach upper elementary or middle grades, consider putting it on your summer reading list. 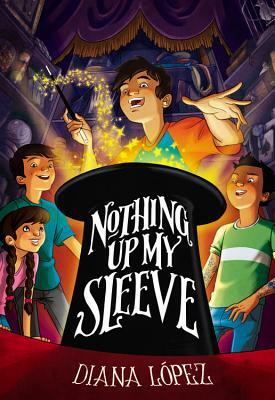 Nothing Up My Sleeve is also an excellent book for classroom use. López fills her writing with various literary elements, which makes the book a solid model for student writing. Two particular elements that she focuses on in this book are metaphor – drawing comparisons between magic tricks and problems the boys face – and alternate perspectives. Each chapter assumes a different point, making the story richer and more complex. Unpacking these literary devices with students and encouraging them to incorporate the devices into their own pieces can really help them hone their creative writing skills. ABOUT THE AUTHOR: A former middle school teacher, Diana López has written several books for children, young adults, and adults, including Confetti Girl, Ask My Mood Ring How I Feel, Choke, and Sofia’s Saints. Her writing has also been featured in the anthologies Hecho en Tejas and You Don’t Have a Clue: Latino Mystery Stories for Teens. In 2004, she received a writing fellowship from the Texas Commission for the Arts and the Alfredo Cisneros del Moral Foundation, and Emporia State University honored Confetti Girl with the William Allen White Award in 2012. She teaches literature and creative writing at the University of Houston—Victoria and serves as managing director for Centro Victoria, an organization that celebrates Mexican-American literature and culture. To learn more about her work, you can visit her website or check out her Twitter. Thanks for the recommendation. I loved Confetti Girl by Diana Lopez and I look forward to reading her newest, Nothing Up My Sleeve.